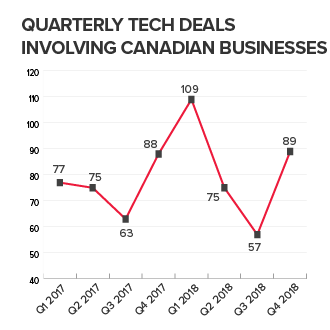 Canadian technology businesses were well represented in Q4 2018, with 89 deals involving a Canadian party announced or closed during the period. 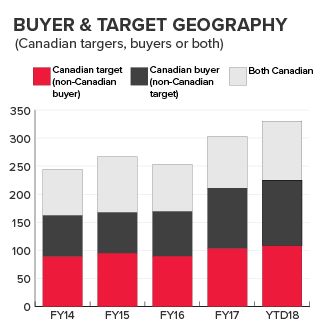 Despite negative macro factors such as volatile equity markets, geopolitical uncertainty, and trade disputes, cross-border deals remained strong as innovative companies continue to push and prioritize the addition of scale, regardless of geographical location and regulatory risk. 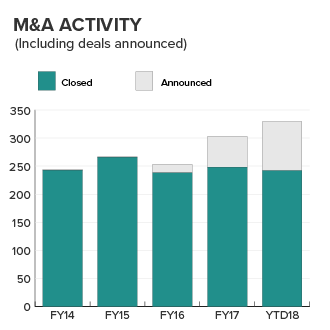 Entering 2019, these macro factors will continue to have an impact on the technology M&A landscape. Businesses will focus on identifying buyers who have an appetite to transact despite macro uncertainty.